The legislation, sponsored by Republican Majority Leader Eric Cantor, would cut food aid by $40 billion over 10 years, affecting up to 6 million hungry families, children, seniors and veterans. 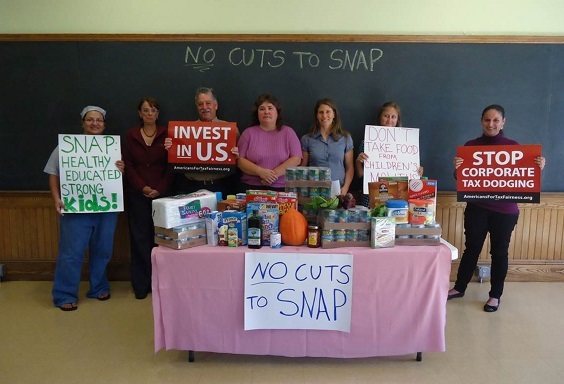 These cuts would come on top of across-the-board cuts to SNAP benefits that are already scheduled to go into effect this fall. In Maine, 1 in 5 residents rely on the anti-hunger program, with 64% of those recipients in families with children. Participants called on lawmakers to close corporate tax loopholes and make large companies such as Apple, General Electric and Verizon finally pay their fair share of federal taxes as a way to prevent these deep cuts.